Knowing geography well is always beneficial, especially these days when globalisation is a fact and a real thing. Trading world widely and travelling is the best way to get to know different countries and so interesting places, people and their culture. Working as a sales manager importing and exporting different goods, food, etc., you must know lots about what there’s good enough to purchase in Asia in order to sell anywhere else, including the USA and Europe. 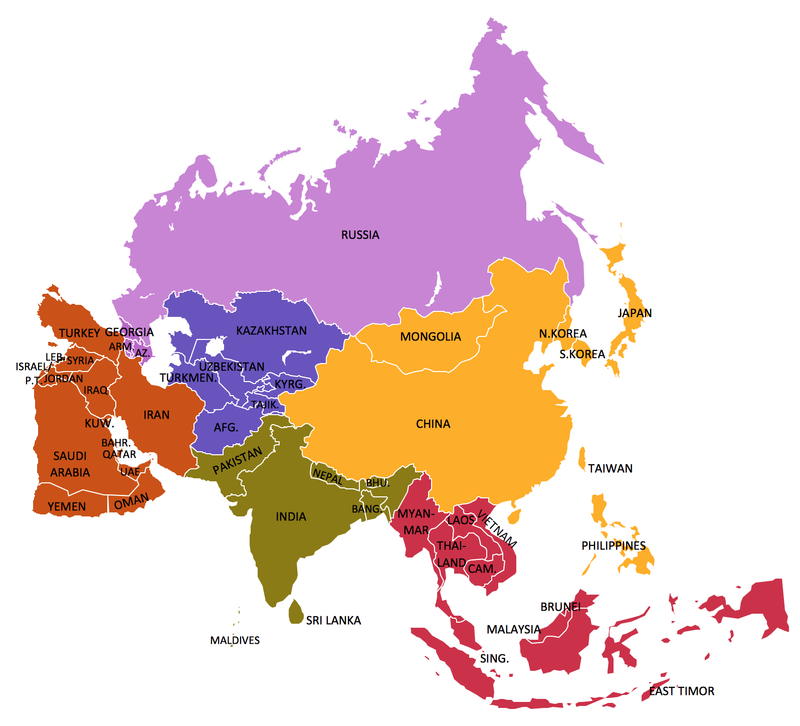 Asia is known as the most populous continent. There are over 4,4 billion people living there. It is also the largest, according to the scale of its territory, continent. Asia is the continent which covers 44 579 000 square kilometres or 17 212 000 square miles which is in total over 8% of the surface area of our planet. Travelling there going to every new city and town every day can take years, and knowing and remembering where exactly those towns are can be simpler having a map. You can always buy a map, but once you don’t find the one you need, then you can always draw your own map. If you think it’s not that simple thing to do, then you may be right in case you don’t have the software where you can create one. ConceptDraw DIAGRAM is a well known software which allows you as well as its other users to make any kind of drawing, including maps and schemes. It is one of the most popular drawing tools for creating something truly special and it allows to use its solutions which are the developed packages of libraries with stencils and examples of already made drawings by those who know lots about the way diagrams and charts, flowcharts and plans should be created, so they look professionally good and smart. There are many rivers all over Asia, including Ural River, and all of them should also be included in your drawing. Suez Canal, Ural Mountains, Caucasus Mountains and seas, which are Caspian and Black, are all a part of Asia. Making your own map of all that, we recommend you not to forget to mention all of that area relief using the different colours. 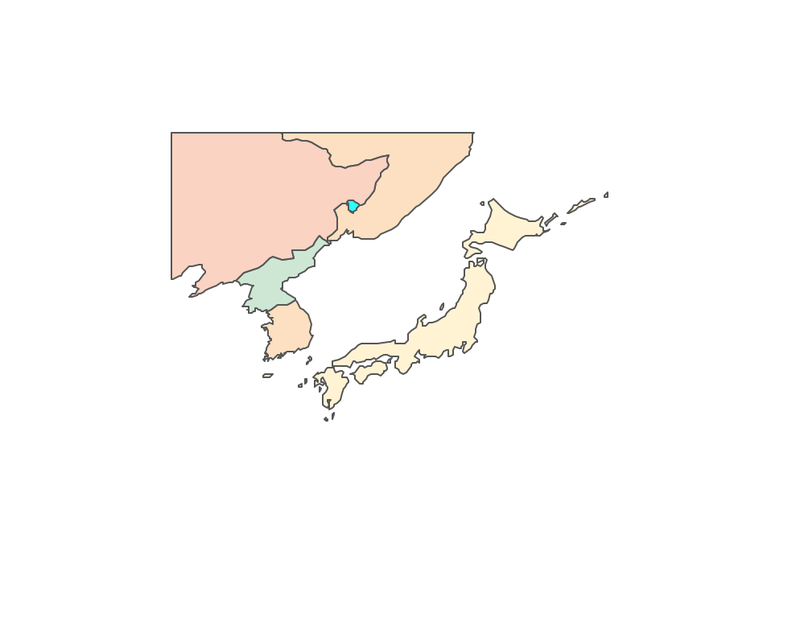 After downloading ConceptDraw DIAGRAM you might not even need to think about the location of each country and place in Asia as there are so many already made maps to choose from in the solution named Continent Maps solution from the Maps area of ConceptDraw Solution Park. You can always download ConceptDraw STORE application all together with ConceptDraw DIAGRAM where you can find so many other solutions and so the stencil libraries and templates and samples. 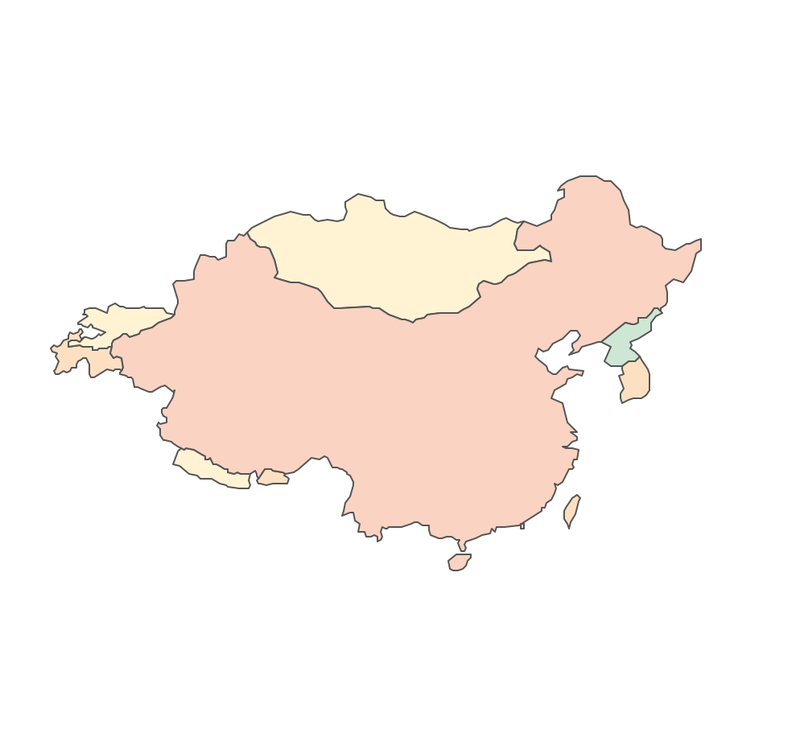 Using Continent Maps solution, which includes the vector design elements library “Asia”, that contains a country map contours for using them in ConceptDraw DIAGRAM diagramming and vector drawing software while making your map of Asia, can simplify your drawing and can make the process of making the needed map entertaining and fun. 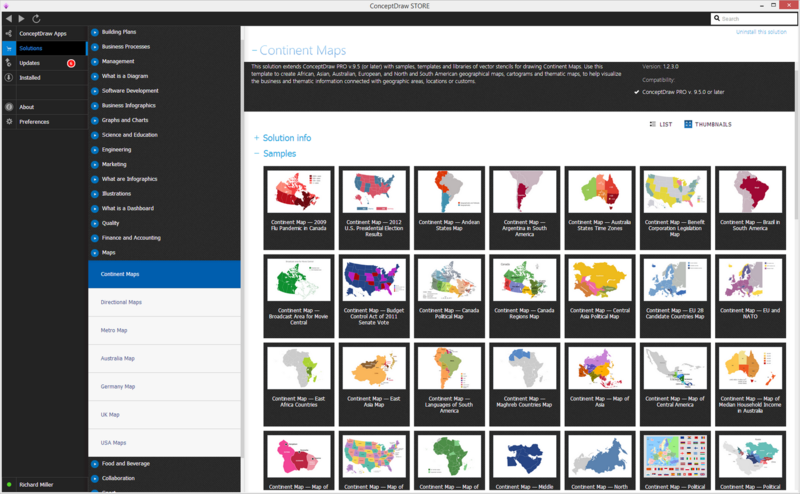 This solution contains the libraries with the design elements of 57 map contours: Asia political map, map contours of countries. 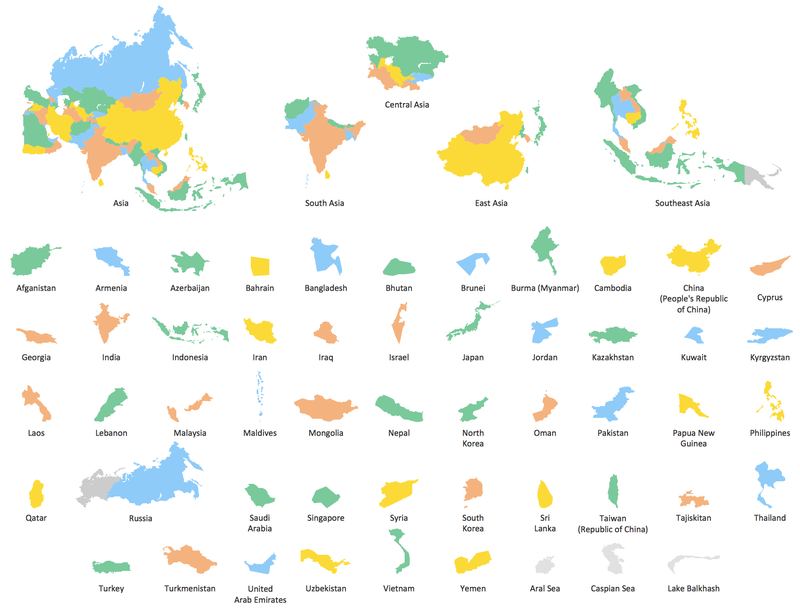 You can choose to use separately the shapes of Central Asia, East Asia, Southeast Asia, South Asia, all of the Asia or you can pick up one of the needed shapes of these territories: Afghanistan, Armenia, Azerbaijan, Bahrain, Bangladesh, Bhutan, Brunei, Cambodia, China, Cyprus, Georgia, India, Indonesia, Iran, Iraq, Israel, Japan, Jordan, Kazakhstan, Kuwait, Kyrgyzstan, Laos, Lebanon, Malaysia, Maldives, Mongolia, Myanmar (Burma), Nepal, North Korea, Oman, Pakistan, Palestine, Philippines, Qatar, Russia, Saudi Arabia, Singapore, South Korea, Sri Lanka, Syria, Taiwan, Tajikistan, Thailand, Timor-Leste, Turkey, Turkmenistan, United Arab Emirates (UAE), Uzbekistan, Vietnam or Yemen. 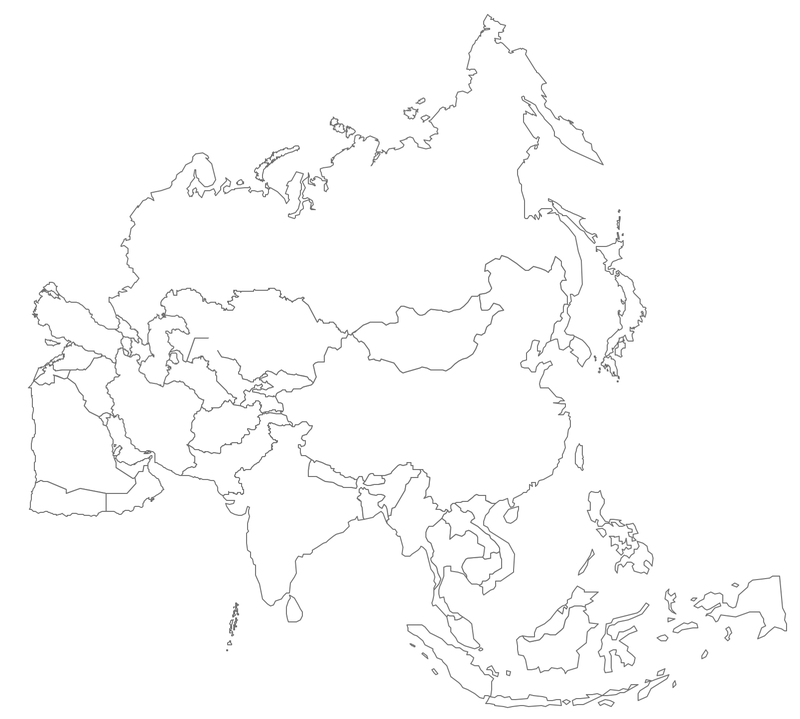 You can find the map made showing only contour lines of the whole continent of Asia. You can find the one showing the population in each country. 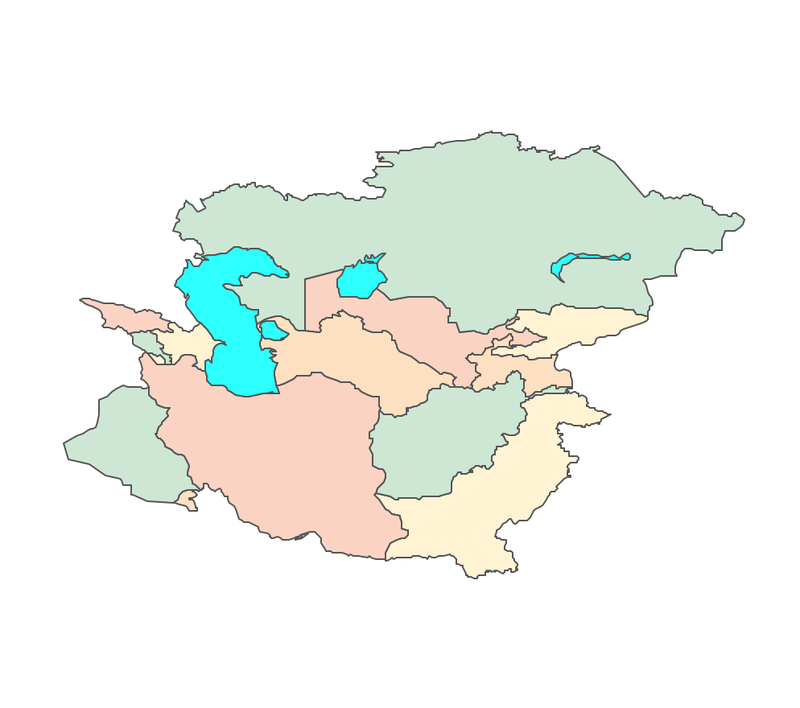 The sample provided by the team of CS Odessa which can be found in ConceptDraw STORE in the “Asia” library shows the Central Asia as the core region of the Asian continent which extends from the Caspian Sea in the west to China in the east; from Afghanistan in the south to Russia in the north. 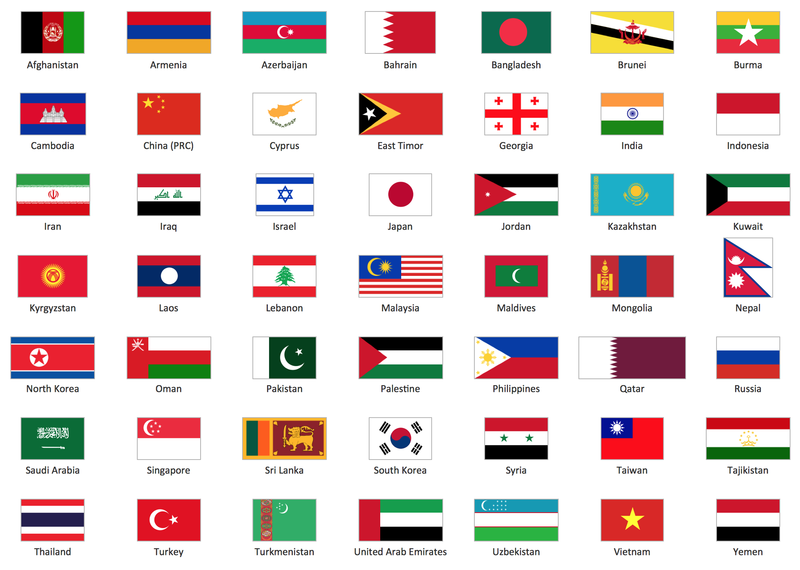 There are 116 vector shapes illustrating the Asia countries flags in colours as they are and you can always use some of them or all of them. Having ConceptDraw DIAGRAM software all together with other products of CS Odessa means having just enough to make your own great looking drawings and enjoy the result which you can expect to get only in a few hours in case you make your map from a scratch, or even in a few minutes in case you use the right solution. CS Odessa team of IT professionals who knows lots about drawing similar maps and who are experienced in making charts, flowcharts, plans, schemes and different maps, always can give you advice on what is better to create and in what way. Having our support team working for ConceptDraw DIAGRAM users making it simpler for them to utilize the software, means having the support during all of the time of you having this application. Download ConceptDraw DIAGRAM today and make it possible to see the final great looking example of what you created yourself with help of the modern tool which is this unique application. Downloading ConceptDraw DIAGRAM we recommend to get also all of the needed solutions which can be found in ConceptDraw STORE and used in ConceptDraw DIAGRAM The solutions with examples and templates of already previously made maps, charts, schemes and other drawings can be also found here on this site. All you need is to choose those which you think can be useful and helpful for you and start using them today, so you can get the final result looking very sophisticated in a very short period of time. All of your final drawings will be the vector graphic files and all of them are always available for reviewing, modifying and converting to a variety of formats, such as image, HTML, PDF file, MS PowerPoint Presentation, Adobe Flash and MS Visio. Central Asia is the core region of the Asian continent and stretches from the Caspian Sea in the west to China in the east and from Afghanistan in the south to Russia in the north. The border between China and Mongolia is the line that limits the territory of People's Republic of China and Mongolia. Stretches 4677 kilometers from east to west, between two triple borders China - Mongolia - Russia. 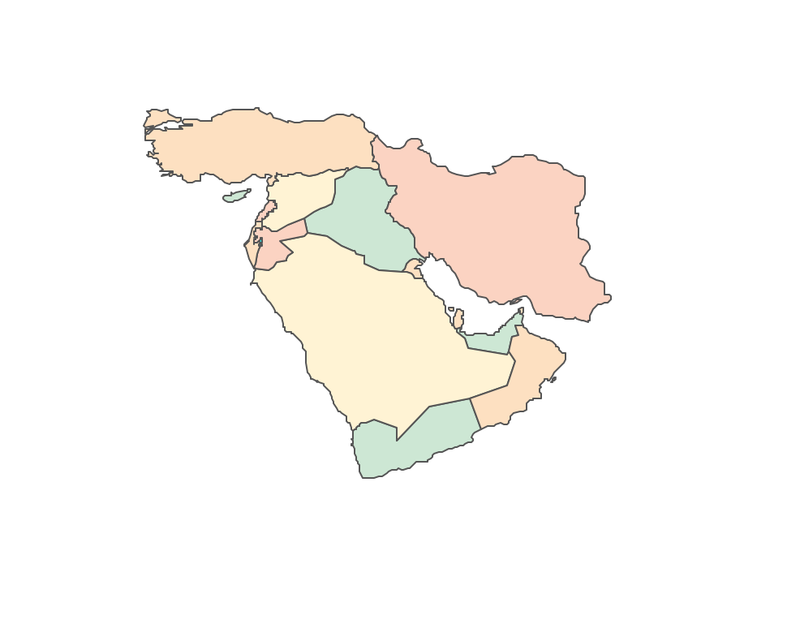 The Middle East (also called the Mid East) is a transcontinental region centered on Western Asia and Egypt. South Asia or Southern Asia is a term used to represent the southern region of the Asian continent, which comprises the sub-Himalayan SAARC countries and, for some authorities, adjoining countries to the west and east. East Asia or Eastern Asia is the eastern subregion of the Asian continent, which can be defined in either geographical or cultural terms. 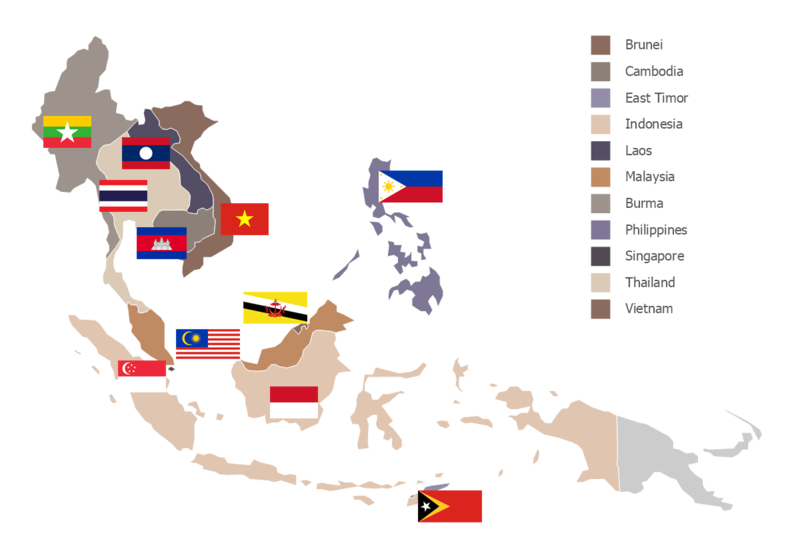 Asia includes both fully recognized states, states with limited recognition, and dependent territories of both Asian and non-Asian states. It lists 48 sovereign states and 6 dependent territories and other territories. One stencils library, 116 vector shapes.